Washington freshman Shawna Conger puts up a shot while guarded by two Madison Plains players during a non-league game at Madison Plains High School Monday, Jan. 9, 2017. 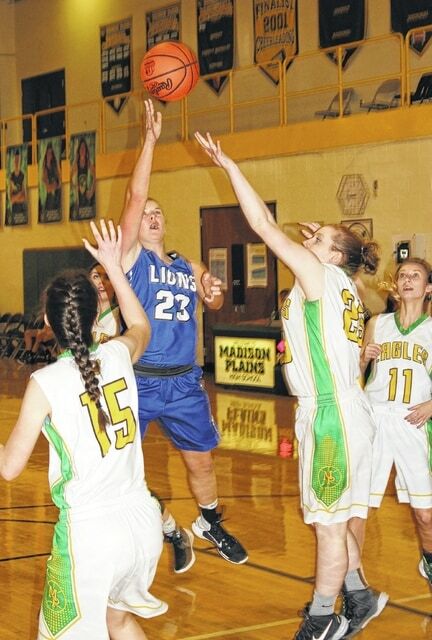 The Washington Lady Blue Lion basketball team had a non-league match-up with the Golden Eagles at Madison Plains High School Monday, Jan. 9. Washington rolled to a 57-27 victory. The win over the former South Central Ohio League rival raises the Lady Lions’ record to 4-6 overall. Washington had four players in double figures in scoring Monday, led by sophomore Hannah Haithcock (also the game’s leading scorer) with 17 points. Haithcock led with nine of her team’s 27 rebounds. Freshman Rayana Burns scored 13 points, senior Savannah Wallace had 11 points and sophomore Bre Taylor had 10 points. Wallace and freshman Shawna Conger each grabbed four rebounds and Wallace had two blocked shots. Burns and Haithcock each had three assists. The host Golden Eagles were led in scoring by a sophomore duo; Brooke Ellison had 11 points and Kerrigan Kelly had 10 points. Unofficially, Washington was 24 of 54 from the field for 44 percent. Madison Plains, who did not make a field goal until Ellison’s bucket with 4:50 to play in the third quarter, was unofficially 9 of 44 for 20 percent. The Lady Lions began the game with a 10-0 run. Madison Plains got on the board with a free throw mid-way through the first period. Washington led 18-1 at the end of the first eight minutes of play. The Lady Lions held a 25-1 lead before the Lady Eagles hit another free throw. Washington led 32-2 late in the second quarter. At the half, the Lady Lions were well on their way to the win, leading 32-5. Washington increased its lead to 38-5 before the first field goal dropped through the hoop for the home team. The Lady Lions were on top, 43-11 after three quarters. Madison Plains went on to outscore Washington, 16-14 in the fourth quarter for the final, 57-27. “I knew Madison Plains graduated eight seniors last year, so I knew they would be down,” Washington head coach Samantha Leach said. “My girls came ready to work. We wanted to work on some things tonight and give everyone an opportunity to play. Everyone got in tonight. “Now, we’re just moving on and looking forward to playing Chillicothe,” Leach said. Washington will be at Chillicothe for an SCOL game Wednesday with the j-v starting at 5:30 p.m.
WASHINGTON — Rayana Burns 5 (1)-0-13; Maddy Garrison 0-0-0; Raven Haithcock 0-0-0; Breanna Taylor 1 (2)-2-10; Kassidy Hines 0-0-0; Savannah Wallace 4 (1)-0-11; Savanna Davis 0-0-0; Tabby Woods 0-1-1; Shawna Conger 1-0-2; Maddy Jenkins 0 (1)-0-3; Hannah Haithcock 8-1-17; Halli Wall 0-0-0. TOTALS — 19 (5)-4-57. Free throw shooting: 4 of 7 for 57 percent. Three-point field goals: Taylor, 2; Burns, Wallace, Jenkins. Field goal shooting: 24 of 55 for 44 percent. Rebounds: 27. Assists: 13. Steals: 11. Blocks: 4. Turnovers: 13. MADISON PLAINS — Kerrigan Kelley 2 (1)-3-10; Brooke Ellison 4-3-11; Aliya Patterson 1-0-2; Ashlynn 1-0-2; Katie Powell 0-0-0; Addison Davison 0-2-2; Bradan Mast 0-0-0; Kaili Patterson 0-0-0; Sami Powell 0-0-0; Addison Tesi 0-0-0. TOTALS — 8 (1)-8-27. Free throw shooting: 8 of 23 for 35 percent. Three-point field goals: Kelley. Field goal shooting: 9 of 44 for 20 percent. Turnovers: 14. In the j-v game Monday, Washington hit seven three-point field goals en route to a 50-18 victory. Washington’s Halli Wall was the game’s leading scorer with 14 points. She hit a pair of three-point field goals. A trio of players, Raven Haithcock, Bre Taylor and Shawna Conger, each scored eight points. Taylor and Conger each hit two threes. Kassidy Hines scored four points, Maddy Jenkins and Maddy Garrison both scord three points. Jenkins’ points came on a three-point field goal. Samantha Sever scored two points. Katie Powell led the Golden Eagles with 11 points. She had both of her team’s three-point field goals. Amiee Dutton scored four, Addison Tesi had two and Alyssa Preece added one points.